Almost two weeks ago I had another fun Southern Bloggers Jubilee meeting with a group of fabulous ladies. 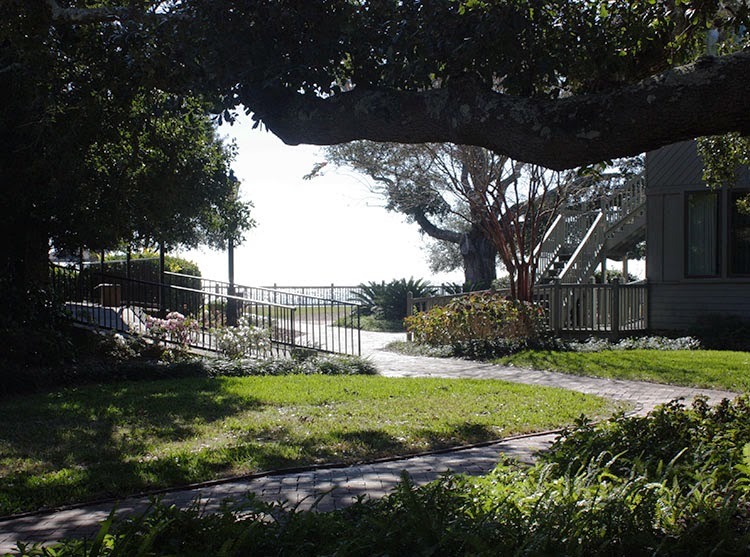 Our meeting location this month was at the beautiful Grand Hotel in Point Clear, Alabama. I just had to snap a ton of pictures to share how lovely this location is, especially during Christmas. 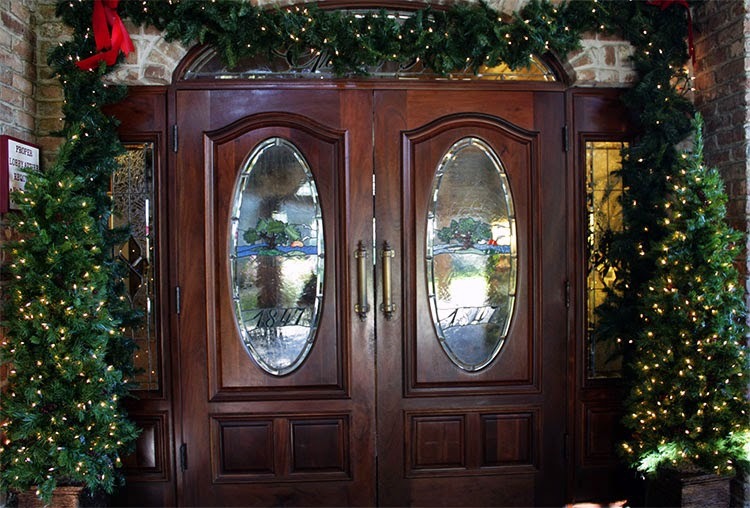 Gorgeous stained glass and wood doors greet you as you enter the lobby. 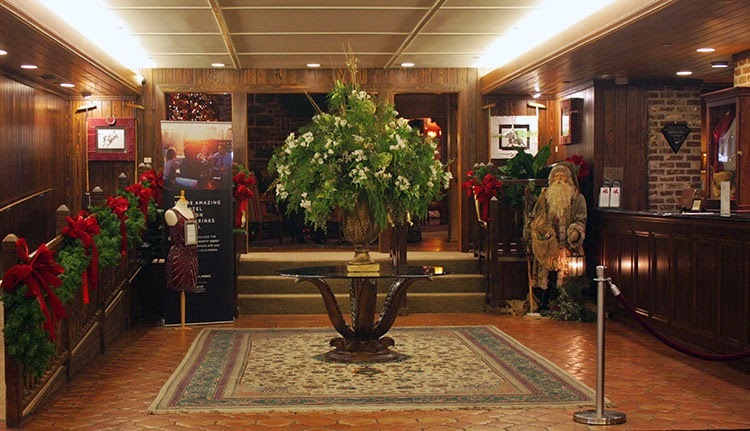 The entrance and check-in area was decorated to the nines. 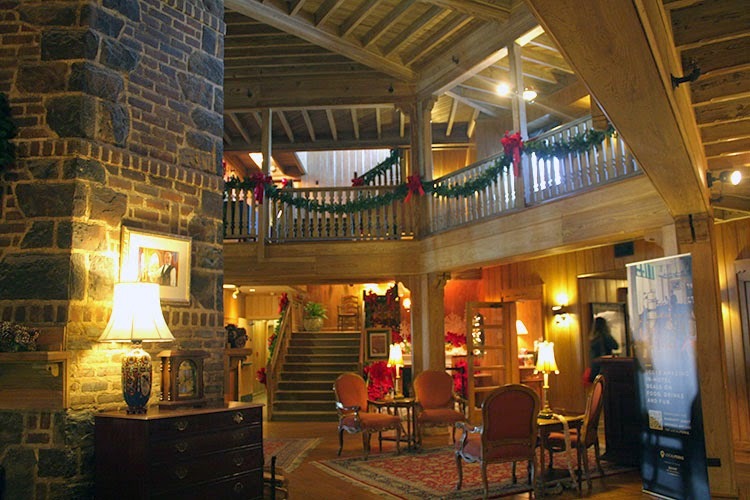 Up a few stairs, you enter a cozy, lodge-like great room with lots of seating. 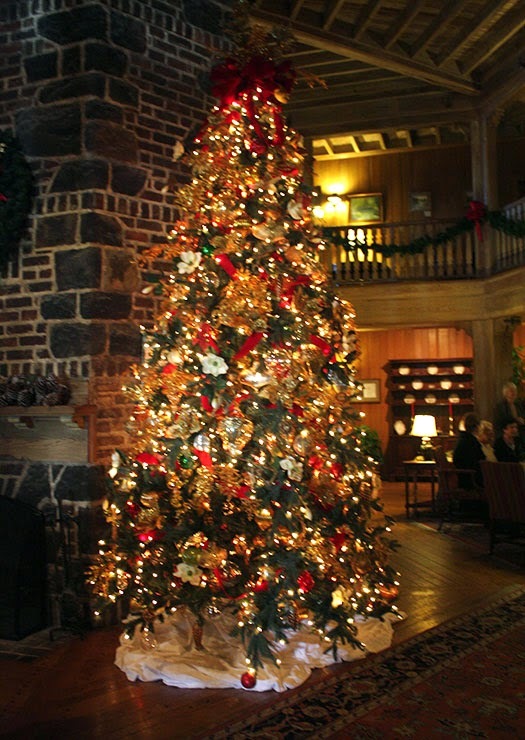 There, I also marveled over the grand Christmas tree just next to the warmth of the fireplace. 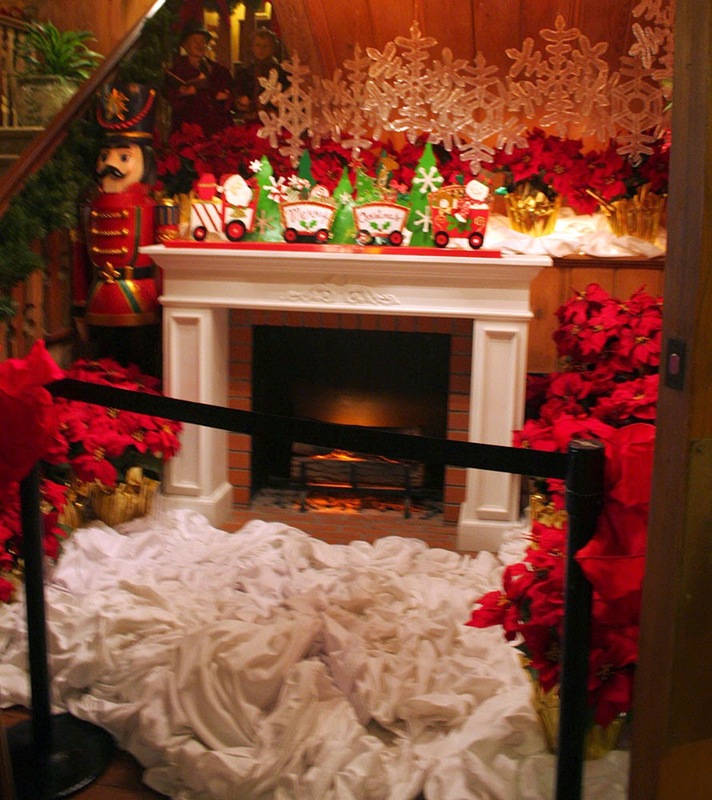 As well, there was a corner set up and waiting for Santa's arrival. 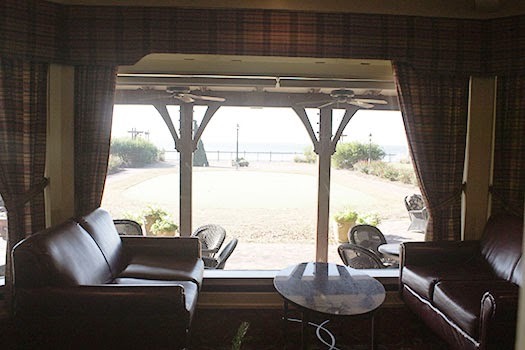 The other bloggers and I met in Bucky's Birdcage Lounge with a view of Mobile Bay. I did take my time strolling back to my car and taking in the scenery. 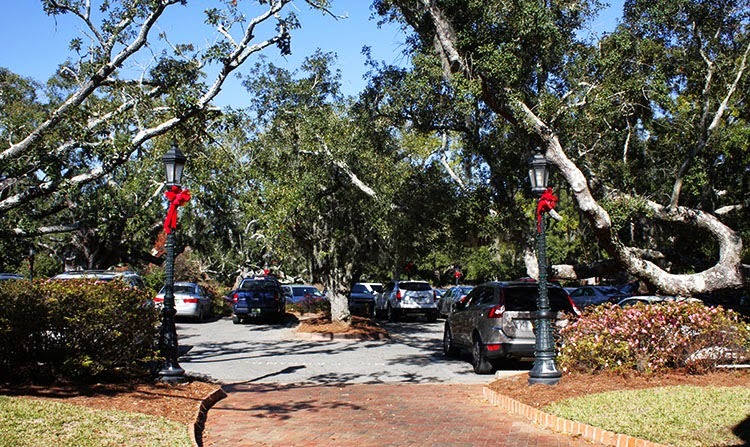 and couldn't help but marvel at the great oaks even in the parking lot. Everywhere I went on my visit to the Grand Hotel, I was greeted in a genuinely warm manner. Every staff person I encountered had a smile and kind words. 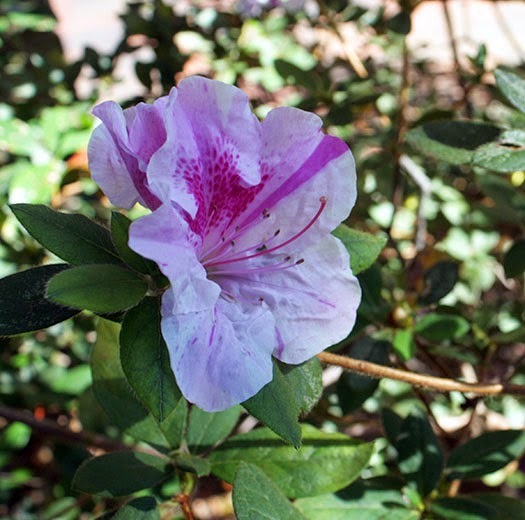 There was a true and welcoming feeling of Southern Hospitality throughout the resort. It really helped me find a little more of the Christmas spirit I needed. Thanks to the Grand Hotel Point Clear for hosting our meeting. Leslie Anne of Fairhope Supply Co. 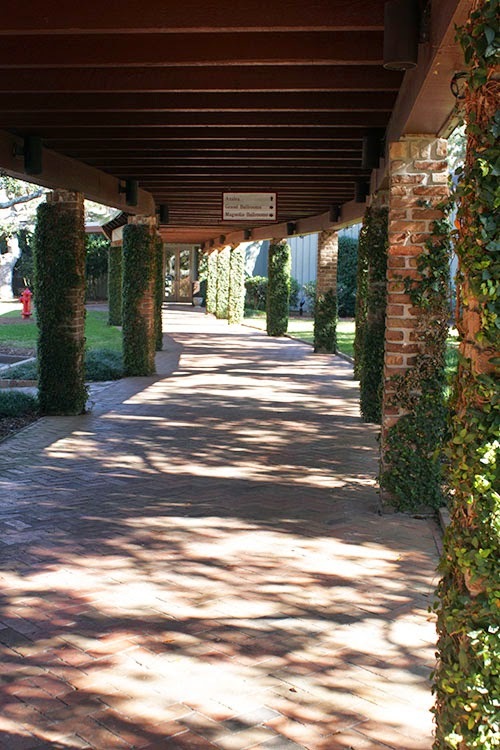 The covered walkway with the vine covered columns is a great shot. I always love walking through there. The grounds are so pretty everywhere you look though, aren't they? Lorraine, Oh yeah! I loved that area. I took more than one photo of it. I love a little mossy, viney anything - so mythical! Yes, the grounds were indeed beautiful. I don't go to the Grand near enough though. Our meeting there was a great way to re-introduce myself to it! The hotel's Christmas decor is beautiful! I love that gingerbread replica of the grounds. Adorable. It must have been fun meeting up with fellow bloggers. Have a very Merry Christmas! Fantastic pics, Hope! You did a great job capturing the mood of the resort. Sounds absolutely lovely. Thank you for the pictures. Hope that looks like such a beautiful place to relax with friends. I just know it was a great time. The Grand Hotel is one of my favorite places! I also did a story today about the hotel's Christmas brunch!